I'm linking up with Kacey from Doodle Bugs Teaching for her Five For Friday even though I'm fashionably late to the party as usual! Go link up as well! This week was all about the science! 1. How many pennies can you drop into a cup before it overflows? I was way off with this one! I need a re-visit with estimation! 2. How many drops of water can you fit on a penny? This was a fun one to do! There were lots of variables to discuss. 3. What happens when you add dish liquid to milk? This was by far the coolest experiment I have ever done! If you haven't tried this yet what are you waiting for! 4. What environment do different bugs prefer? This was a fan favorite. Kindergarteners love bugs! They made great observations and predictions! 5. What happens when you melt crayons with a hairdryer? This was just for fun for me. I love melted crayon art! It is so relaxing. Until it splatters all over your walls and you have a lot of clean up to do. 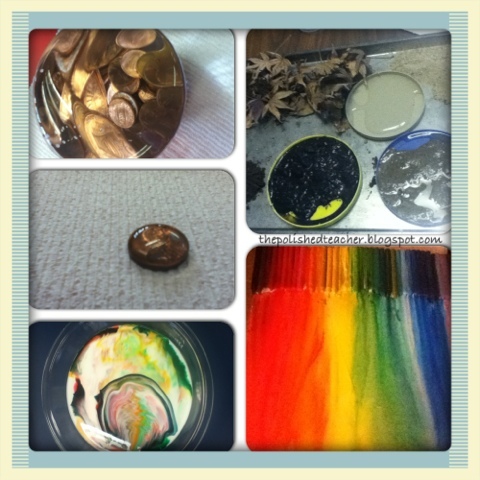 What is your favorite science experiment? I'd love to know! Great experiments! The melted crayon art is beautiful. I have seen that all over Pinterest and must try it with my grand kids one of these days. Oh my, your melting crayon projects are so awesome! LOVE IT! This was my first time linking up for the 5 for Friday and I am so glad I did! So many new teachers bubbling with great ideas! Thanks for sharing! LOVE all the experiments you shared... I need to try the milk one!